Members of the University of Houston-Victoria Homecoming Court stand with UHV’s mascot, jaX, Monday during the Homecoming Kickoff. 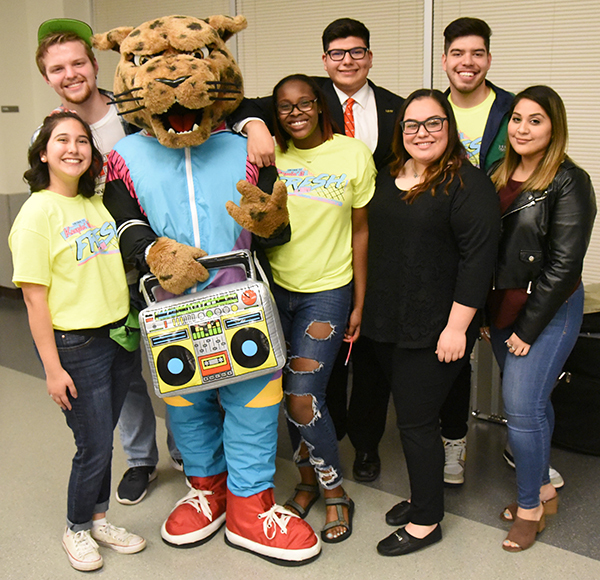 Pictured from left are Sophia Solano of San Antonio, Randall Jasek of Palacios, Alexis Wallace of Austin, Alvaro De La Cruz of Conroe, Marissa Cervantes of San Antonio, Cesar Gonzalez of Rosenberg and Cynthia Ortega of Katy. Leticia Evans of Houston also is on the Homecoming Court but was unable to attend. UHV students will vote during Homecoming week to select the Homecoming king and queen from members of the court. The king and queen will be announced Saturday at Riverside Stadium after the first Homecoming baseball game. The games against Wiley College will begin at noon.